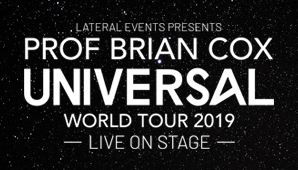 Lateral Events is pleased to announce Prof Brian Cox’s first world tour ‘Professor Brian Cox Universal World Tour 2019’ will land in New Zealand in June 2019. Having set two Guinness World Record titles with his previous sell-out live tour, Professor Brian Cox is heading back out on the road with a brand-new show for 2019, Professor Brian Cox Universal World Tour 2019. Beginning in the UK in February, North America in April and May, Professor Brian Cox then lands in Hong Kong, Singapore, New Zealand and Australia in June 2019. Using state of the art graphics and imagery from ground-based telescopes and space probes, presented using ultra-high-resolution LED screen technology, Brian will explore the latest missions to the planets, the nature of space and time from the Big Bang to black holes and the origin and fate of life and intelligence in the Universe. He will also address questions about the value of science, how we acquire scientific knowledge and why we should trust it. Visual highlights will include a journey around and into a black hole, created in partnership with Double Negative, the four-time Academy Award-winning visual effects company responsible for creating the black hole effects in the movie Interstellar. Taking audiences to the edge of our current understanding about the origin and evolution of our Solar System and the Universe, Professor Brian Cox Live 2019 offers a fascinating insight into the workings of nature at the most fundamental level. Whether an avid science reader or a total novice, Professor Cox makes challenging ideas accessible to all, exploring the vast, possibly infinite universe and our place within it from earth to the edges of the cosmos. Brian will be joined by co-host of The Infinite Monkey Cage and award-winning comedian Robin Ince to oversee an audience Q&A, giving fans the chance to ask any questions they have and making every show unique.